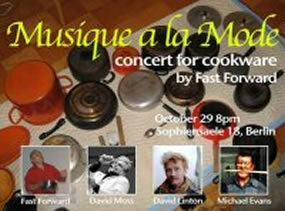 Musique a la Mode — a concert with David Moss, David Linton, Michael Evans and Fast Forward :: October 29, 2009; 8:00 – 10:00 pm :: Sophiensaele 18 – 10178 Berlin Mitte. Musique a la Mode is a concert in which all the instruments are derived from the common day kitchen. Performed by a quartet including musicians from New York and Berlin – David Moss, David Linton, Michael Evans and Fast Forward. This will be the world premiere of this new group work.